Paraska Tolan Szkilnik is a PhD candidate at the University of Pennsylvania. 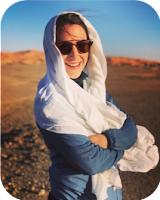 She obtained her BA from Brandeis University in 2011 and an MA from the EHESS (École des Hautes Études en Sciences Sociales) in 2014, working on the relationship between Senegal and Tunisia in the 1960s and 70s. Her doctoral work is concerned with the history of cultural Pan-Africanism in the Maghreb in the decades following independence. Moving away from the strictly political approach of much of the literature on Pan-Africanism, her dissertation reconsiders the history of Pan-Africanism in the postcolonial period by centering on three Maghrebi cultural spaces of encounter between Black and non-Black African and Diaspora artists in the late 1960s and early 1970s: the Journées Cinématographiques de Carthage (JCC), the Moroccan literary journal Souffles, and the Pan-African Festival of Algiers of 1969 (PANAF). Beginning in Morocco, this podcast follows the adventures of a group of Luso-African poets and militants (chief amongst them Mario de Andrade, Marcelino dos Santos and Aquino Bragança) from Paris to Rabat. Starting in the late 1950s, these young militants used Rabat as a home-base for anti-colonial activism in the Portuguese colonies. The Moroccan government provided them with passports, headquarters, press coverage, and weapons. Morocco also served as a liberated space, on the African continent, to imagine what one could be in the wake of empire. In Rabat, these militant-poets met young Moroccan writers who were haunted by similar concerns over their role in the postcolonial world, amongst them poet Abdellatif Laabi founder of the Moroccan literary journal Souffles. Over the course of its seven years of publication, 1966-1973, Souffles took off from a marginal Moroccan literary journal to a paper caucus through which writers from across the African diaspora called for an African cultural revolution. On the pages of this shabby 30-something page journal, Laabi welcomed contributions from Haitian poet René Depestre, Moroccan novelist Tahar Ben Jelloun, Angolan insurgent Mario de Andrade, and Cape Verdean militant Amilcar Cabral. Working in tandem with these writers, the journal provided a platform to discuss the great issues of the decade: decolonization, Marxism-Leninism, civil rights in the United States, and of course Portuguese colonialism. This episode is part of the Arts and Letters in the Maghrib series and was recorded on November 8th, 2018 at the Centre d'Études Maghrébines à Tunis (CEMAT), in Tunis, Tunisia. de Bragança, Silvia. 2011 . Battles Waged, Lasting Dreams, Aquino de Bragança: the man and his times. (Goa: Goa). Byrne, Jeffrey James. 2016. Mecca of Revolution: Algeria, Decolonization and the Third World. (Oxford: Oxford University Press). Césaire, Aimé. 1939. Cahier d’un retour au pays natal. (Paris: Présence Africaine). Edwards, Brent Hayes. 2003. The Practice of Diaspora: Literature, Translation and the Rise of Black Internationalism. (Cambridge: Harvard University Press). Gilroy, Paul. 1995. The Black Atlantic: Modernity and Double Consciousness. (Cambridge: Harvard University Press). Goebels, Michael. 2015. Anti-Imperial Metropolis: Interwar Paris and the Seeds of Third World Nationalism. (Cambridge: Cambridge University Press). Laâbi, Jocelyne. 2005. La Liqueur d’Aloes. (Paris: Difference). Mokhtefi, Elaine. 2018. Algiers Third World Capital: Freedom Fighters, Revolutionaries, Black Panthers. (London: Verso). Pinto de Andrade, Mario. 1997. Uma Entrevista dada a Michel Laban. (Lisboa: Edições João Sá da Costa). Sefraoui, Kenza. 2013. La Revue Souffles, 1966-1973: Espoirs de Révolution Culturelle au Maroc. (Rabat: Editions du Sirocco). Stafford, Andy. 2009. “Tricontinentalism in recent Moroccan intellectual history: the case of Souffles.” Journal of Transatlantic Studies. Volume 7, pp. 218-232.